The 55-year reign of the Canadian Sea King is coming to a close. In December, a crew from 443 Maritime Helicopter Squadron in Patricia Bay, British Columbia, will fly the CH-124 Sea King on its last flight for the Royal Canadian Air Force (RCAF). 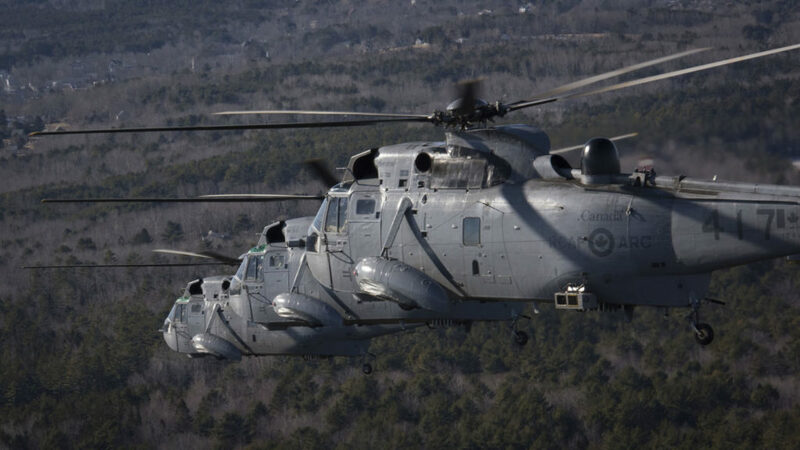 Earlier this year, their counterparts at 423 Maritime Helicopter Squadron in Shearwater, Nova Scotia, marked the aircraft’s final East Coast mission on Jan. 26, 2018. While five helicopters are still operational until the end of the year in British Columbia, Canada’s remaining 23 Sea Kings have been retired and are currently making their way through the fleet disposal process. Administered by the Department of National Defence (DND) and Public Services and Procurement Canada (PSPC), this process aims to repurpose, sell or otherwise dispose of the old helicopters in a safe and environmentally responsible manner. While final arrangements for the aircraft are subject to change, DND told Vertical on Oct. 2 that eight of the 28 remaining aircraft will be publicly displayed by the Canadian Armed Forces at various bases and museums across the country. Another airframe will be retained by the Royal Canadian Air Force (RCAF) as a training aid, and one will be displayed at the Canada Aviation and Space Museum in Ottawa. Three aircraft were demilitarized and scrapped due to their poor condition, with components being recycled where possible. The remaining 15 Sea Kings and their associated parts – 12 are currently located at 12 Wing Shearwater and three are at Patricia Bay – are now for sale, a process that is being administered by PSPC. “Essentially, we have a website that is used to source interest for controlled and sensitive assets that are for sale,” explained Josée Doucet, manager of the GCMil group at PSPC, which deals with the disposal of surplus Canadian military goods. The helicopters are being sold in “as is, where is” condition. Doucet said she was very pleased by the number of potential bidders who attended the Shearwater event. 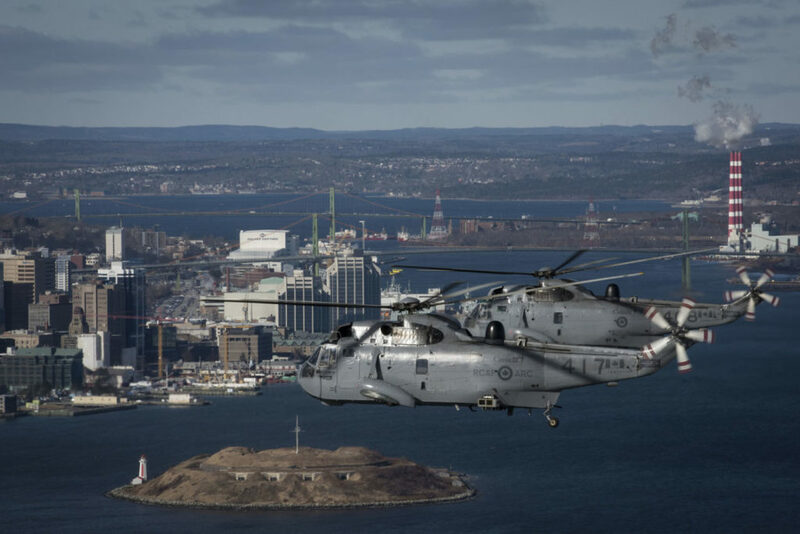 While Doucet said that timeline has not yet been finalized with DND, she indicated the goal would be to have a purchase agreement in place by the time the Sea Kings cease flying on Dec. 31. Before the Sea Kings went on the market, controlled goods and military equipment were removed from the airframes wherever possible. Doucet said all Canadian bidders must be registered in the Controlled Goods Program. Interested foreign purchasers must be enrolled in their nation’s equivalent program, which allows them to view military assets. While Doucet declined to estimate the Sea Kings’ worth, she said a myriad of factors are considered when selecting the winning bid. These include single-asset or full-lot bids, depreciation, condition of the fleet, and the costs to DND to maintain the helicopters as they await sale. 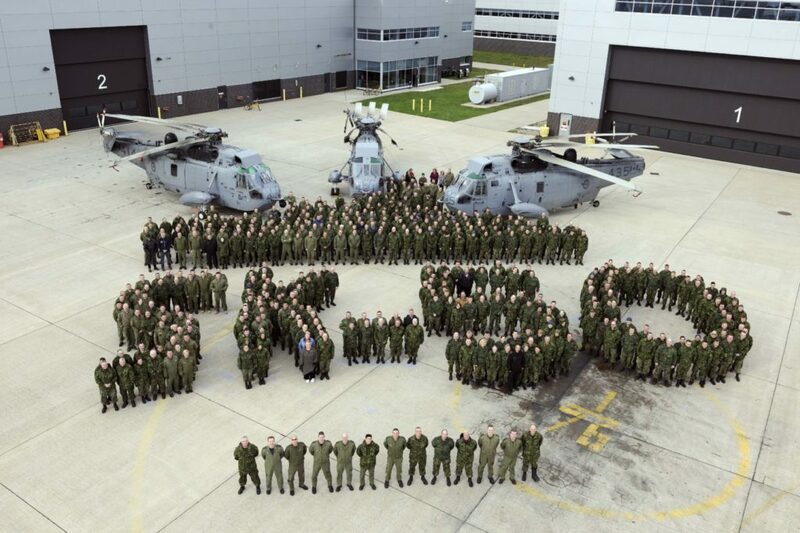 12 Wing Shearwater personnel gathered for a photo to commemorate the CH-124 Sea King helicopter’s 50th anniversary. The photo was taken on the flight line in front of 423 Maritime Helicopter and 12 Air Maintenance Squadrons. Cpl Nedia Coutinho, 12 Imaging Services, Shearwater, Nova Scotia. Ultimately, she said fleet value will be driven by market demand. 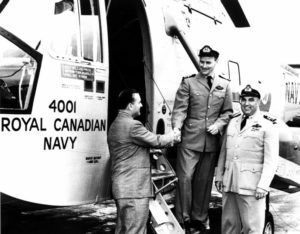 Canada accepted its first CH-124 Sea King on May 24, 1963. Since then, the maritime helicopter has earned its legendary status in the Canadian Armed Forces, serving with distinction on Her Majesty’s Canadian Ship Bonaventure (the country’s last aircraft carrier, retired in 1970), as well as St. Laurent-class destroyer escorts, Iroquois-class destroyers, auxiliary oiler replenishment ships, and Halifax-class frigates. No other aircraft in Canadian service has ever commanded such a lasting multi-generational legacy. While 15 Sea Kings are destined for new homes, nine will remain on public display to ensure its story will never be forgotten. It’s a fitting tribute to a King that ruled the waves for more than half a century.